I am in Halloween mode. someone at My Tinas closet group that I belong to was talking about wire mesh being on sale a Hobby Lobby so I went to Hobby Lobby to check it out because if It was on sale I needed some of course. :-) I saw a lady making a huge wreath being made by a woman there to sale. I asked her a couple questions about it and she showed me how easy it was to make it and I decided on the spot I had t make some. 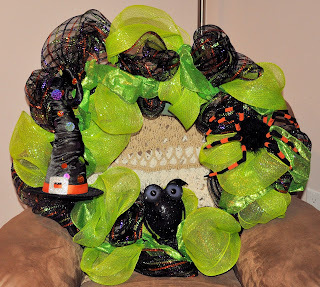 I bought the stuff to make a halloween one and 3 Christmas ones because My girls will say I want one when they see it. :-) These pictures dont do it justice but here it is.